Oh my am I behind on my blogging! So let me get you all up to speed on what has been going on. My Mother has small cell carcinoma, metastatic stage 4, in other words, terminal. She has started chemo therapy and is tolerating it well. It hopefully will buy her some time. Obviously none of us knows how long but at present she is active and enjoying the social life at the manor although she does tire more easily. That's where we're at on that front. Right after the first of the year I had a routine physical, first one in like at least 7 years. High blood pressure ( no surprise there! ), and high blood sugar. In other words Type 2 Diabetes. Finally, something I CAN control. With meds and diet changes weight is coming down, BP coming down and blood sugar all lowering. Good news but then again, my bar is low these days. We have sent out feelers to some local Border Terrier breeders. I just can't bring myself to look for another Cairn and this time around I want a nicely bred pup of a fairly healthy terrier breed. Everyone needs some sunshine and lightness in their lives and this is mine. I've always admired them when Earth dogging with my Cairns many years ago. If you know of any BT breeders on the West Coast, send me their names, please! but we also have shared some pretty funny things we remember about him. I think I sometimes hear him coming down the hallway. Each dog has their own cadence that I know by heart and then, of course, it's gone. 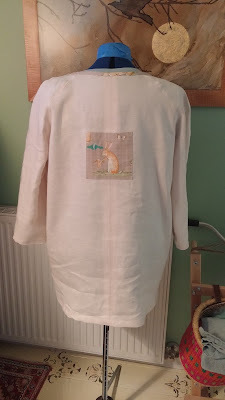 There has been some mental health sewing and weaving, not much but some! 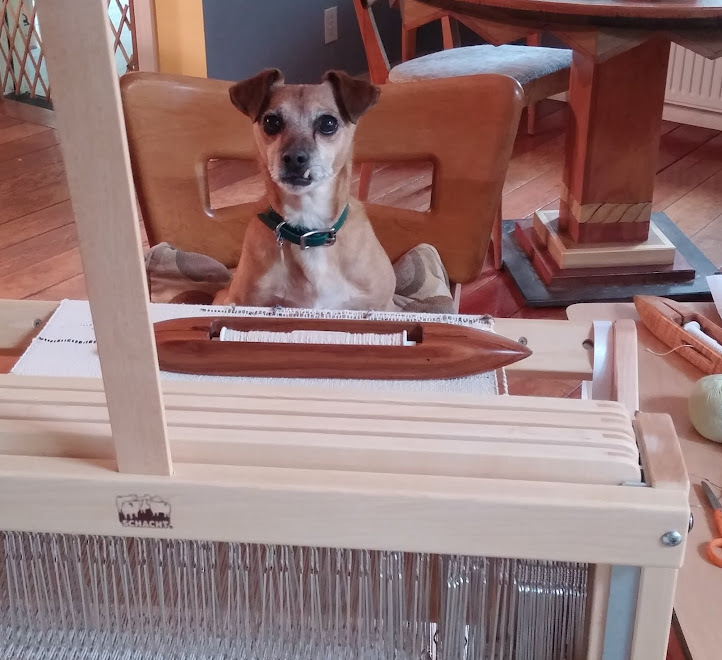 I am sorely frustrated with my hemp towel warp and need to resley the whole thing. I was at an angle once I put the reed upright. Bah Humbug! 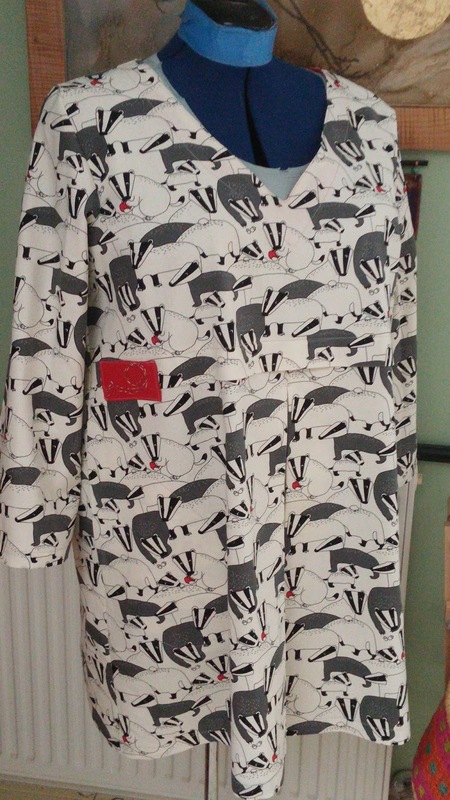 And then there was the sewing wadder...... OH MY! number with a hood. 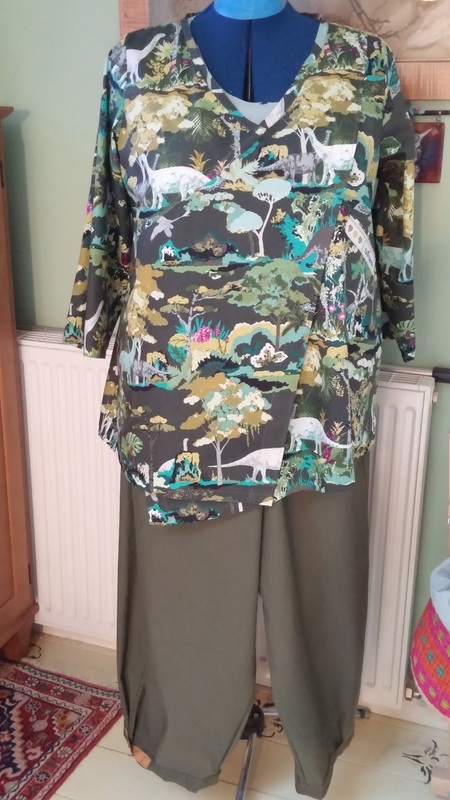 I have this cut out in leftover linen scraps. The crap brown denim Folkwear one hit the trash. 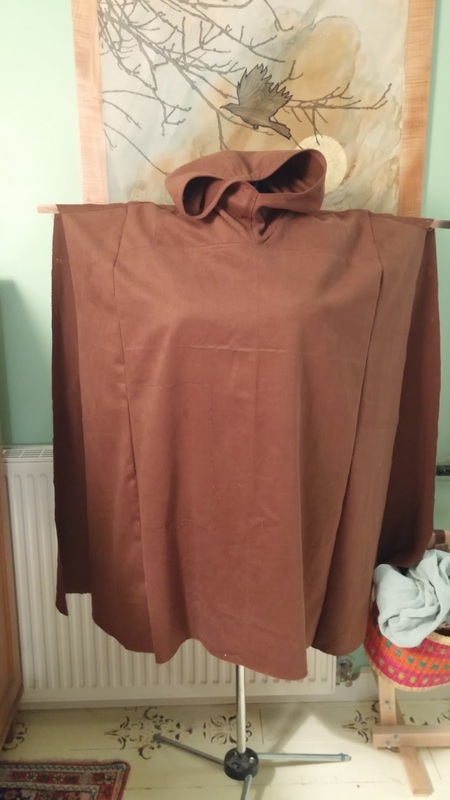 I just couldn't rally myself at the time to save cheap brown denim. Shame on me. 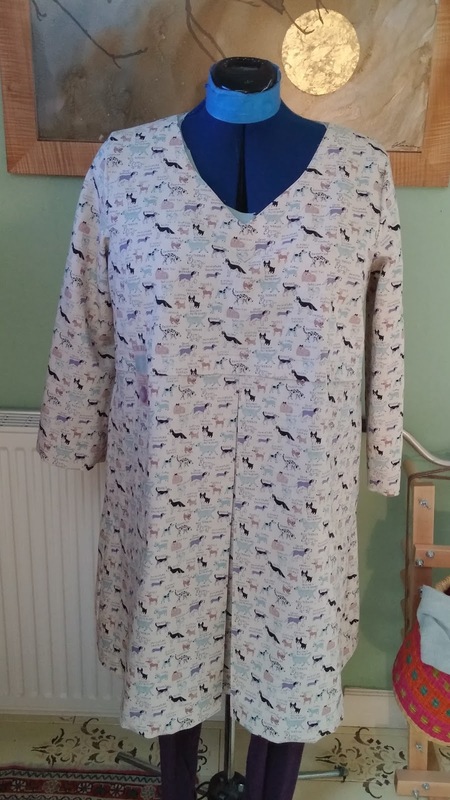 some too big pants in a strange not cotton (no matter what they said on the listing), fabric from Etsy and finally, this cute little linen and cotton dress/tunic with dogs on it. Biggify to see the print better. 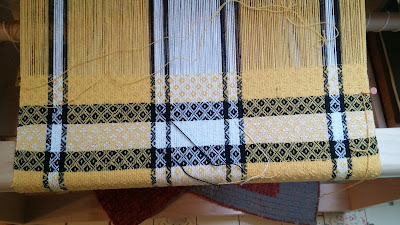 The bumblebee towels move slowly but I so love weaving them when I finally set to it. This one is getting black and white bands at either end. I have yet to get my act together to measure out a rose path warp for the Pup and a sheep towel warp for the Spring, but soon, maybe today I'll make a start on one of them. Lastly on the fiber front, some spinning. 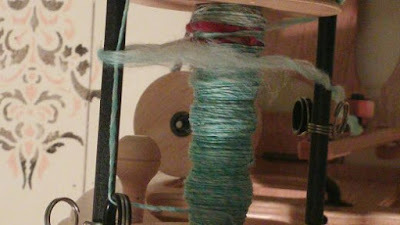 This is lovely roving from Inglenook Fibers. So beautifully prepared it almost sings itself! Love the color. Given the awful situation that racist asshat occupying the White House has caused, I'm leave you with an oldie of song, but sadly, still quite relevant don't you think? Parting shot: The sewing salon bunker. I believe I am in love with your bumblebee towel... I had never heard of Border Terriers - what a handsome breed! It's so true - the difference cadence of toenails on the floor. I can tell the cat from the dogs, the dogs from each other. Mr. Butters always taps out triple-time. 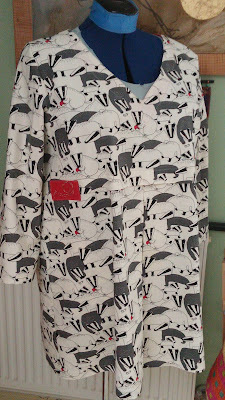 I love the fabrics you find and use - those badgers are fabulous! I am so afraid of becoming numb to the idiocy in the White House that I have to pinch myself hard after every outrageous event. But it does defy belief at times. Holding you and your mom in my thoughts. We have to actively fight "outrage fatigue" so his shenanigans don't become normalized; a formidable challenge. Yes, a puppy would be a good dose of sunshine and lightness; think I'll go out and ride my "dose"! ^^What she says about normalizing shenanigans. Ugh. I too, love your towel. 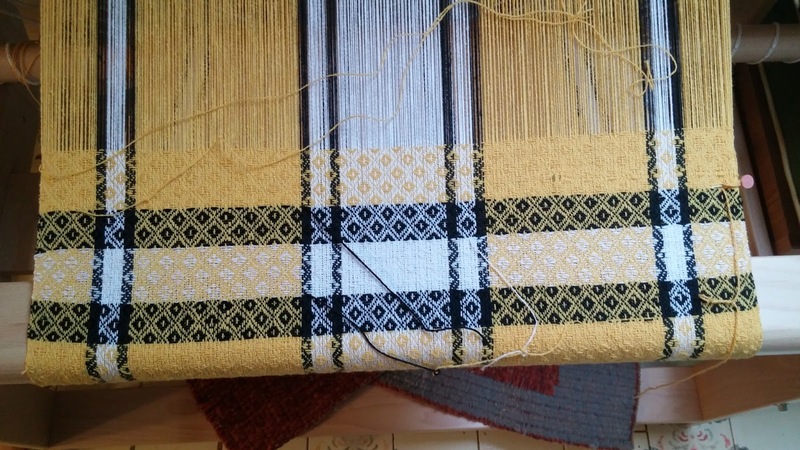 That's a really neat pattern. Border Terriers are really cute. And a puppy. I love puppies. I hope you find a breeder somewhat close and are able to go visit while there really little. Those little puppy sausages with ear flaps and stumpy legs are adorable. I fell in love with Border Terriers years ago when I watched Monarch of the Glen. What neat little dogs...and true terriers. It looks like sewing is good therapy...keep it up! A new puppy will certainly keep you busy LOL. 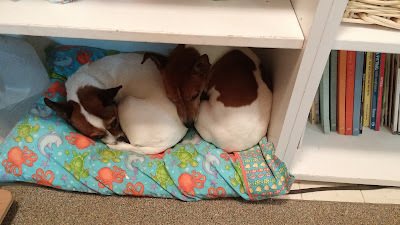 Keeping our 'tween Doxie warm in this weather is a challenge so I took washcloths that were going to be recycled out of the house and made rice tubes. Then a fleece "pillowcase" is added after a turn in the microwave. The pay-off is the contented sighs when I put it in her bed (wrapped in some more fleece to keep it warm and not scorch her). She puts her back and hips against it then when it cools down some she'll put her paws on it. We don't worry about keeping her warm in the house now. Hugs for your and your little ones. You are so prolific in the sewing salon! I'd love to get through one day without hearing about White House antics - it's depressing. 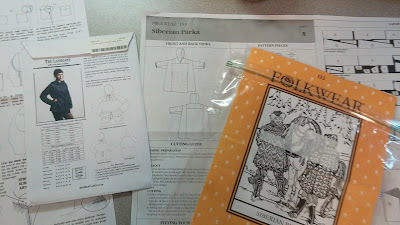 Your sewing is wonderful, and I am wondering, was the Folkware pattern bad or just too big.... I have the pattern and was considering making it, but won't bother if you think it is crappy.